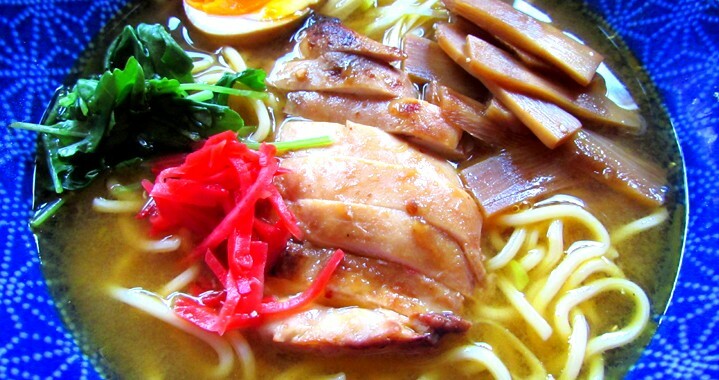 A great basic chicken topping for your ramen, this has a savoury-sweet flavour. Any leftover glaze can be added to your broth for extra flavour. Heat the oil in a wok and add the garlic, ginger and spring onion. Fry until aromatic. Add the soy sauces, honey and water, mix well and bring to the boil. Turn the heat down and place a lid over the wok, allowing a gap for some of the steam to escape. Turn the chicken over every 5 minutes to allow the flavours to infuse into the meat fully. Cook this way until the liquid has reduced to a shiny, sticky glaze which clings to the meat. Allow to cool slightly before slicing into bite size pieces and serving. Posted in Recipes, Toppings and tagged Chicken, Toppings.